"I hunted down the beast within/and then it was no longer a beast," Patrick Foley writes in "Living in London: A Recollection," one of the poems in his first collection Morning Rituals. With clear-eyed attention to morning rituals- the scraps and tag-ends and daily repetitions that give a life continuity- these poems map the surprising terra incognita inherent in the everyday. A self's understanding becomes its own discovery, a process not limited to words on the page: accompanied by a full-length CD of Foley's sonic and musical explorations of captured improvisational sessions. 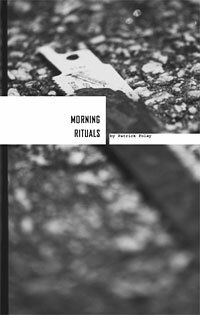 Morning Rituals is the sixth title from Fifth Planet Press. This book combines raw music recordings and poems with progressive design concepts by artist Wade Thompson and Agi Morawska. This collection is like a polished found object, as its contents weren't written with intentions of ever being published. Patrick's work, he claims, while serious sounding, is actually mindfully ironic and stems from a desire for people to "lighten up." Printed in an edition of 500.